During the American Revolution, in which the future United States fought for its independence from Britain (1781 to 1784), tens of thousands of refugees were forced to flee. Because they were loyal to Britain, they were called "Loyalists." Many of these Loyalists were Blacks who had been promised their freedom if they would fight on the British side. The response was overwhelming as some 30 000 Blacks escaped to British lines. They served in the war as soldiers, labourers, ships' pilots and cooks. Many Black Loyalists landed at Shelburne, in southeastern Nova Scotia, and later created their own community nearby in Birchtown. With a population of more than 2500, Birchtown was the largest settlement of free Blacks outside Africa. Others settled around the colony and in New Brunswick. 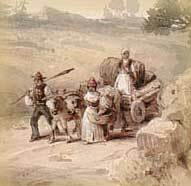 Most of the Black Loyalists never received the land or provisions that they were promised and were forced to earn meagre wages as farm hands or domestics. They suffered in a climate far colder than what they were used to and from unfair treatment from the authorities. When in 1791 a British company offered to relocate Blacks to Sierra Leone, in West Africa, almost half the disappointed Black community of Nova Scotia left. Approximately 2500 remained and their situation slowly improved. Wages rose and many qualified for skilled trades. By 1812 Blacks felt enough a part of the community to form three separate Black militia units to fight against the Americans in the War of 1812. Check out the many resources that chronicle the harsh living conditions endured by Black Loyalists in New Brunswick. From the website Black Loyalists in New Brunswick. This online book includes journal entries concerning the voyage of Jamaican Maroons from Nova Scotia to Sierra Leone and daily events in "Granville Town" from the perspective of George Ross, agent for the Sierra Leone Company. From the Our Roots website. This article offers a decidedly American slant on issues related to the role of enslaved Africans in the American Revolution, the plight of Black Loyalists, and subsequent attempts to settle in Sierra Leone. From the New Yorker magazine in the US. A BBC News story about Freetown, Sierra Leone, and its efforts to replace British street names with the names of Africans, such as Thomas Peters, who fought in the abolition movement. Listen to CBC podcasts of the entire Lawrence Hill novel The Book of Negroes. View an image of a watercolour painting depicting some of the 15 vessels in the Freetown harbour that made the voyage from Nova Scotia during the winter of 1792. From the website Remembering Black Loyalists, Black Communities in Nova Scotia, the Nova Scotia Museum and the Virtual Museum of Canada. Read excerpts from this book that focus on the circumstances leading up to the exodus of Black Loyalists to Sierra Leone and the subsequent problems the new settlers encountered in Freetown. From Google Books. A brief synopsis of the book Rough Crossings: Britain, the Slaves and the American Revolution. From York University. A review of Rough Crossings: Britain, the Slaves and the American Revolution, described as a story about "18th-century slavery." From the guardian.co.uk website. This paper attempts to untangle the complexities of the legal status of “Black Loyalists” in the years following the American Revolution. From the website Black Loyalists in New Brunswick. Listen to a CBC Radio program in which Lawrence Hill talks about The Book of Negroes, his book about the life of formerly enslaved Afican Aminata Diallo and the hardships she endured in Nova Scotia and in subsequent journeys to Sierra Leone and Britain. A detailed biography of Thomas Peters, Black Loyalist and leader of Black Nova Scotians in Sierra Leone. From the Dictionary of Canadian Biography Online.